What are cold fronts and warm fronts? Fronts are the boundaries between air masses of different temperature. If warm air is moving toward cold air, it is a �warm front�. These are shown on weather maps as a red line with scallops on it. If cold air is moving toward warm air, then it is a �cold front�. Cold fronts are always shown as a blue line with arrow points on it. If neither air mass is moving very much, it is called a �stationary front�, shown as an alternating red and blue line. 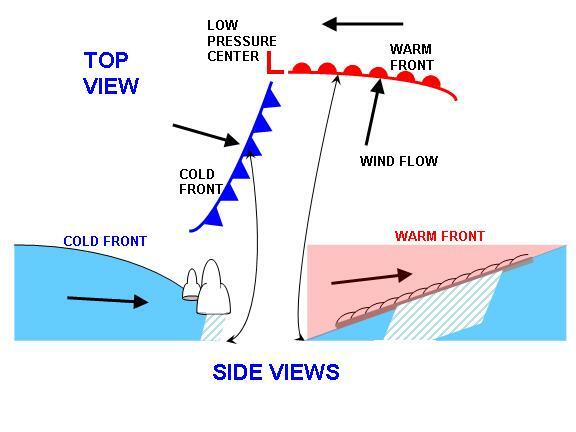 Usually, a cold front will be associated with a warm front, with a low pressure center, connecting them (see above). This frontal "system" can be thought of as separating a cold air mass from a warm air mass, and the two different types of fronts simply indicate which direction those portions of the different air masses are moving. Most of Earth's disturbed weather (widespread cloud and precipitation systems) outside of the deep tropics occurs along or near fronts as part of extratropical cyclone systems. The Earth�s rotation is very important to the formation of fronts. The rotation of the Earth causes the wind that would normally flow directly from one air mass to another to, instead, flow around the air masses. This helps maintain the air masses� identity, as well as the �front� between the airmasses. WINTER FRONTS ARE THE STRONGEST: As cold air masses develop over Asia and North America in the wintertime, the strongest fronts occur when these cold air masses move toward the warmer, oceanic air masses that surround the continents.